Here’s a list of some of my favorite places to enjoy the spirit of the season. Six Flags St. Louis presents Holiday in the Park as the theme park is transformed into a winter wonderland. Over one million lights will adorn the park and set the stage for a magical holiday celebration. Amid the many festive decorations and displays located throughout the park, guests can take in one of the live, holiday themed shows, visit with Santa in his cottage, enjoy some of their favorite holiday treats and experience the various street entertainment. In between the holiday festivities, guests can enjoy some of their favorite rides or warm up by one of the many crackling fires located throughout the park. Holiday in the Park will take place on select days November 23rd through January 1st. Take part in the holiday magic at the St. Louis Anheuser-Busch Brewery Lights where guests can enjoy more than a million twinkling lights, special beer, food and entertainment this holiday season. The Brewery Lights will kick off the holidays with a public lighting ceremony on Nov. 15 at 5:30 p.m. with the help of a special guest. Open every Thursday – Sunday through December 30 from 5pm – 10pm. This family friendly event features fun for all ages. Enjoy the Bud Light Ice Skating rink which is back again this year! Come visit our Kid Zone where kids of all ages can take a ride on our Bevo Express train, enjoy Frosty’s Winter Wonderland on the big screen, play Ice Breaker or enjoy the Lite Brite and afterwards the whole family can warm up at our Soup Bar. While this is a free event, there are several special packages and a la carte options available to guests and sampling. Food tokens available for purchase. Drive-through tours are welcome at the St. Louis brewery Monday through Wednesday evenings after dusk until midnight. Visitors can enter from Arsenal Street turning onto Seventh Street and then travel along Pestalozzi Street. Holiday Cheers Package – Perfect for those looking to enjoy our offerings and take home a few souvenirs. VIP Package – Elevate your experience while escaping the cool temparatures with access to our hot buffet, private parking and so much more! Clydesdale VIP Package – The ideal pacakge for Clydesdale lovers who dream of a private session with them. Fire Pit Fun Package – Fun for families and small parties looking to access our fire pits and indoor museum space. Includes two reserved parking spaces. During Brewery Lights, come meet and get your photo taken with one of our Budweiser Clydesdales at no charge. Thursdays through Sundays from 5:30pm – 9:30pm in the Budweiser Clydesdale Stables. Winter Wonderland is open for vehicular traffic and carriage rides Sunday thru Friday from 5:30pm – 9:30pm. Saturdays are closed to vehicular traffic and reserved for carriage rides only. Open nightly from 5 to 10 p.m.
You’ll be enchanted by whimsical animal-themed displays throughout the Zoo, including a larger-than-life swan family, towering giraffes, an illuminated penguin colony, and much more. Visit with the cool birds at Penguin & Puffin Coast and warm up in the tropics of the Monsanto Insectarium where you’ll see colorful insects from around the world. Please note these are the only animal exhibits open at night during the event. Kids can take part in winter crafts and activities and meet costumed characters. Enjoy holiday carolers and other strolling live performances on weekend nights. Climb aboard your favorite animal on the Mary Ann Lee Conservation Carousel. Chill out in the 4D Theater featuring “The Polar Express 4D Experience.” Rides are free with event admission and operate weather permitting. Roast your own campfire s’mores (available for purchase) at one of the fire pits. Enjoy dinner, snacks, hot chocolate, holiday drinks and more available at food locations throughout the Zoo. Shop for a variety of unique gifts at Zoo gift shops and receive a 10 percent discount on any purchase; Zoo members receive a 20 percent discount. Tickets can be purchased in advance at stlzoo.org/wildlights, or at the door on nights of the event starting at 5:30 p.m. Ticket sales and event entrances will close at 8 p.m.
Children under age 2 are free. Free parking is available on Zoo parking lots during event hours. We are open EVERY night Nov. 16, 2018- Jan. 7, 2019 including Thanksgiving, Christmas Eve, Christmas, and New Year’s Eve. Admission Fees – One price entertains the entire family! The happiest season of the year is going to be bigger and better than ever at St. Louis Union Station. This year 14 new attractions and experiences will make Holidays at Union Station the biggest holiday hot spot in the Midwest. 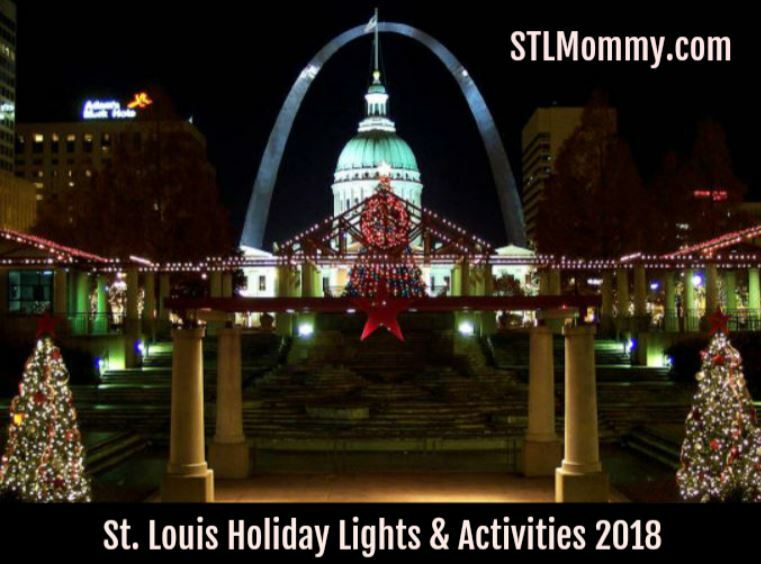 Trains begin running from St. Louis Union Station to the North Pole on November 16, 2018, the day after Thanksgiving, and continue through December 30, 2018. Tickets, combined with holiday hotel packages at the St. Louis Union Station Hotel, at www.STLPolarExpressRide.com. The magical story of a boy’s search for the meaning of Christmas comes to life when real trains departs St. Louis Union Station for a round-trip journey to the North Pole. Set to the sounds of the motion picture soundtrack, passengers will relive the magic of the story as they are whisked away on THE POLAR EXPRESS™. Once onboard, hot chocolate and cookies are served as passengers read along with the classic children’s book, The Polar Express, by Chris Van Allsburg. Santa and his helpers greet passengers at the North Pole and then board the train, where each child is given the first gift of Christmas – a silver sleigh bell. Chefs aboard each car lead passengers in singing Christmas carols on the ride back to St. Louis Union Station. Riders may choose from two classes of service on The Polar Express — Coach and First-Class. Coach tickets start at $39; First-Class at $65. First-class ticketholders will receive a Polar Express mug and will be seated at four-top tables. They also will receive a free photo with Santa. More information about dates, fares and excursion times are available by calling 314-942-6942, or by visiting www.STLPolarExpressRide.com. Families are encouraged to wear their pajamas for the ride. In addition to the train ride, St. Louis Union Station will be running a holiday fire and light show set to Christmas music on the train shed lake. St. Louis Union Station also will host a series of magical holiday dinners in the beautiful Grand Hall of the historic train station during the Polar Express season. Featuring 3-D light shows projected on the ceiling and visits with Santa’s elves and holiday characters, the dinner sessions are available at TIME on selected days when the Polar Express Train Ride is in operation. Dinners are served buffet style with separate adult and children’s selections priced at $25 for adults and $20 for children 12 and under. Children ages two and under are complimentary. An elaborate holiday dessert buffet accompanies the dinners. Reservations may be purchased online at www.STLPolarExpressRide.com. Celebration of Lights is a holiday light display held at Fort Zumwalt Park. Each scene is designed and funded by local organizations, churches and businesses. Started in 1991, the event attracts more than 10,000 vehicles each year and more than 10,000 individuals during the Old-Fashioned Holiday Stroll. Sunday, Tuesday through Thursday (except December 11th & 12th), 6 – 9 p.m.
Wednesday – Sunday, bring a food pantry donation of canned or boxed goods and get a $1 discount per vehicle. Please note, Celebration of Lights is closed on Christmas Day, December 25. The annual Wentzville Holiday Night Lights dispaly at Rotary Park opens on Friday, Nov. 23rd for the holiday season. Come enjoy a one-mile light display that features large illuminated commercial scenes and tunnels of twinkling lights. This holiday display is a great way to experience the magic and joy of a winter wonderland close to home. Drive-thru admission is $8 for vehicles holding up to six passengers; $1 per additional passenger. The display is open 6:30 – 9:30 p.m. on the dates in red. November 23rd through December 26th. Hear the sleigh bells jingle and see 3 million lights twinkle amongst a beautiful backdrop at Rock Spring Park’s Christmas Wonderland. Visitors can turn off their headlights and let the holiday displays carry them through the magical scene. Or, make the night even more memorable with a horse drawn carriage ride through the park! Carriage rides will be available Saturdays on a first-come, first served available basis (weather permitting). The cost is $30 for the first person; $5 each additional person, regardless of age. Reservations can be made for other evenings with advanced reservations (based on availability) by phoning Black Tie Carriage Company and Kris Mooney at (217) 242-1104. There will also be a special walk-through night (no cars allowed) the first Monday after Thanksgiving. This year the walk through will benefit the United Way. Those who bring a donation for United Way’s Community Christmas will be admitted for free. For those who do not bring items, the $1 admission fee will be donated to Community Christmas. Admission for the walk-through night is $1 per person. For more information about Christmas Wonderland, call (800) 258-6645. Celebrate Christmas with a stroll through Central Park in Bethalto, enjoying decorated lighted Christmas-themed cottages, live music, food, Santa Claus, holiday vendors and crafters, live nativity scene and more. Bethalto Christmas Village is a free, family-fun event designed to share the Spirit of Christmas throughout the community and region. Created for all ages, by all ages, Bethalto Christmas Village embodies the cooperation of residents, businesses, churches, civic organizations and village officials to create an amazing Christmas experience! There will be musical entertainment from 5 – 8 p.m. each night. Opens November 24th. For more information, call (618)377-8051. Colorful lights and hand-painted scenes are used to create a Victorian style holiday show for the whole family. The drive through display is set up at Horner Park in Lebanon. That’s about 30 minutes from downtown St. Louis. Winter Wonderland is open Sunday through Thursday from 5 p.m. to 9 p.m., and Friday and Saturday from 5 p.m. to 10 p.m. Admission is free, but donations are accepted. Christmas in St. Louis is pleased to announce that the 2017 Ameren Missouri Festival of Lights will return to Kiener Plaza! The Festival of Lights will take place Saturday, November 17th and will include a host of live entertainment, lighting of the Salvation Army Tree of Lights, and a festive fireworks finale. Christmas Traditions is a month-long celebration of Christmas in St. Charles. The festival runs Wednesdays, Fridays, Saturdays and Sundays from the day after Thanksgiving through Christmas Eve. In addition to the 80 plus costumed characters who are always “making seasons bright”, there are a host of other activities to enjoy while you’re in St. Charles for Christmas. View all of the activities including the tree lightning ceremony HERE. Back again this year, Warm Springs Ranch invites all to the second annual Holiday Lights while visiting the world-famous Budweiser Clydesdales! From November 23rd through December 30th, guests with reservations will be able to visit Warm Springs Ranch from 5 to 9 p.m. Thursday through Sunday and see the property decked out in thousands of twinkling lights. Holiday Lights will be kicking off this year with a special lighting ceremony on Nov. 23 at 5:30 p.m.